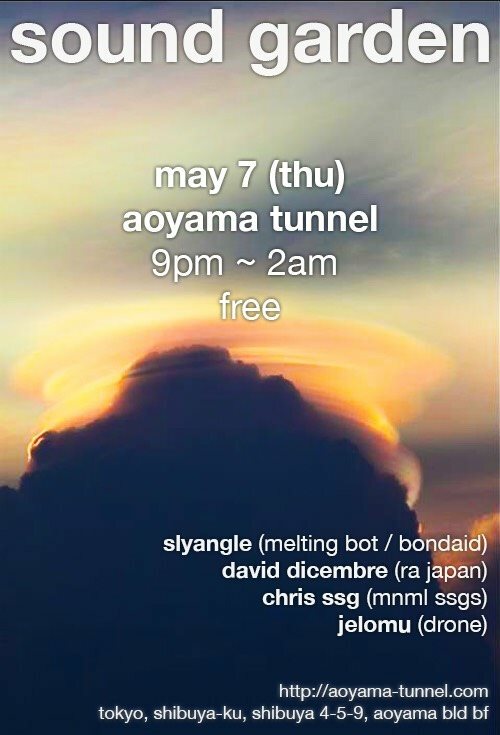 The next Sound Garden at Aoyama Tunnel is scheduled to provided some relaxation after all the Golden Week craziness… This time we are very happy to invite SlyAngle as our guest. He’s responsible for the recent series of BONDAID parties, which have been pushing really innovative and interesting sounds in Tokyo. SlyAngle’s interest in challenging, forward thinking music matches closely with our aesthetic and we are really looking forward to hearing his selection. Expect some fresh music. Joining him will be your usual Sound Garden residends, Chris, David and Jerome. By now you know what to expect: quality music and a relaxed, friendly atmosphere. So come down and have a drink with us. Thursday 7 May, 21:00 – 2:00, FREE.